What we desperately shut our minds to is once again being pronounced ever more clearly: climate change is here; it is already bringing devastating extreme weather events; it will become worse in the years to come. In late September, part 1 of the fifth assessment report (AR5) of the Intergovernmental Panel on Climate Change (IPCC) was released in Stockholm. The panel was extra cautious and even timid in its examination of the issues, but the conclusion is dire nevertheless: the world has pumped so much carbon dioxide and other greenhouse gases into the atmosphere that we are in for some extra rude surprises. Climate sceptics, who had torn apart IPCC’s last report, are still trying for ways to manipulate public opinion. They know that public perception is not based on hard science or its many nuances. It can be influenced by getting a single message out however distorted it may be. So even before the report was released, there was a selective leak that the report has found a “pause”—the world is not warming as fast as predicted earlier. This word was quickly circulated, media picked up the buzz and they hoped opinion would be formed. Unfortunately for the sceptics, this tactic cannot work so easily anymore. People across the world are beginning to experience some change or the other in the weather pattern. They are seeing increased activity of tropical typhoons; unseasonal and extreme rain events leading to devastating flooding; extreme heat and cold and the melting of the Arctic. They hardly need IPCC to tell them about the inevitability of climate change. The fact is that IPCC never said that there was a “pause”. A selective reading of a leaked draft report was used to spread the canard. The final report states that the rate of warming over the past 15 years (1998-2012) is less than the rate calculated since 1951 per decade. But the report qualifies this by saying that the base year (1998) was when El Nino was the strongest and the world had seen higher than ever temperatures. Therefore, not only is there no evidence of a pause, but on the contrary, there is evidence that past scientific models and projections have been accurate and reliable. For instance, it is now confirmed that the atmosphere and oceans have warmed; the amount of snow and ice has diminished; and the concentrations of greenhouse gases released because of human activity have increased manifold. That is what should frighten us—not that scientific observations were wrong but that they were right. For the Indian subcontinent, there is news and it is not good. This is the first time IPCC has included special mention of the region’s true finance minister, the monsoon. Till recently, most regional models did not take into account this capricious phenomenon, which rules our lives, so there was little knowledge about how precipitation patterns would behave in an increasingly warmer world. Now the models project the following: there is medium confidence (IPCC terminology used when models predict less than high certainty) that Indian summer monsoon circulation will weaken but will be compensated by increased moisture content in the atmosphere because of warming oceans, ultimately leading to more precipitation. More rain is predicted but worryingly in fewer days. The monsoon, says IPCC, will probably be most impacted by extremes in Indian as compared to elsewhere. IPCC report also says monsoon onset is likely to become earlier and retreat very likely delayed, leading to longer rainy seasons. While IPCC juggles with the degree of likeliness—its definition being that very likely signifies 90-100 per cent certainty and likely 66-100 per cent certainty—science theories are being enacted in the real world. In India we are seeing right now how the monsoon has still not retreated from the subcontinent—there is devastation in Gujarat, Uttar Pradesh and eastern India because of untimely rains. When extreme rainfall happened in Uttarakhand, which took over 6,000 lives and destroyed an entire region, it was said that rains came too early. Therefore, it is time science led to action. At the global level nations have to act to reduce emissions—drastically, urgently and keeping in mind issues of equity. At the national level, our agenda must be to cope with extreme, unseasonal and variable rainfall. This means becoming obsessive about water management. The fact is that climate change is not all bad news for us because it will rain more, not less. The key is to learn to hold the water, store it and recharge groundwater with it. It will also mean planning better to forecast extreme rain events so that we can mitigate the damage of the Uttarakhand-type calamity. It will mean doing all we know we must do: value the raindrop. Rural development minister Jairam Ramesh and Gujarat Chief Minister Narendra Modi were only half right when they said India needs toilets not temples. In an increasingly warmer world, India’s only temples can be the ditches, drains, lakes and rivers that can hold the rainwater and not let it cause floods or droughts. Krishna Kumar Kanikicharla, climate scientist at Pune's IITM and one of the drafting authors of the IPCC report, told TOI there was "growing evidence" of the impact of the climate change on monsoons in South Asia and the tropical cyclone system in the Bay of Bengal. Kanikicharla, said: "There is strong hint that the duration of the rainy season would increase due to early onset of monsoon. The quantum of rainfall will also increase during the later part of this century." He said though the Indian summer monsoon circulation will weaken, rainfall will increase due to higher atmospheric moisture resulting from a rise in temperatures. In its projection for South Asia, the technical summary of the report clearly points at "enhanced summer monsoon precipitation and increased rainfall extremes of landfall cyclones on the coasts of the Bay of Bengal and Arabian Sea". 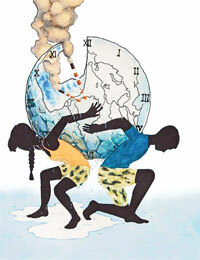 Prashant Goswami, chief scientist at Bangalore's CSIR Centre for Mathematical Modeling and Computer Simulation and one of the lead authors of the IPCC report, admitted that these conclusions were based on climatic projections that were not as firm as those made at a global level. "These uncertainties increase as you go to smaller scale (from global to regional or from regional to sub-regional levels). But one has to have an element of faith in these conclusions which are based on well defined scientific methodology," Goswami told to TOI,. As far as global temperature is concerned, the summary report said it was likely to rise by 0.3 to 4.8 degrees Celsius by the end of the century. Sea levels, it said, could rise by 26-82 centimetres by the end of the century. These observations run like a street vendorÃ”Ã‡Ã–s pep talk. It says the temperature may go up by 0.3 to 4.8 degrees Celsius and sea levels may rise by 26-82 centimeters asking us to have faith in those conclusions. Science does not work on faith but survive on facts and figures. You can see the range of variations in temperature and sea level rise. It is un-natural way of telling as for as science is concerned. This has no significant meaning. Also, they clearly accepted this by saying that Ã”Ã‡Â£these conclusions were based on climatic projections that were not as firm as those made at a global levelÃ”Ã‡Ã˜. This has no scientific sanctity. Ã”Ã‡Ã³	Finally, all the conclusions drawn by IPCC are of hypothetical in nature. Marine scientists warned on Thursday that our oceans are declining more rapidly than previously thought Ã”Ã‡Ã¶ becoming ever warmer and more acidic and losing oxygen at an alarming rate. "It is the simultaneous occurrence of the 'deadly trio' of acidification, warming and de-oxygenation that is seriously affecting how productive and efficient the ocean is". It also warned of a fast drop in dissolved oxygen in seawater Ã”Ã‡Ã¶ with predictions of a 1-7 per cent decline by 2100 caused by the effects of global warming and nutrient runoff into the sea from agricultural fertilizers and sewage. The new report said the average upper ocean temperature has increased by 0.6 degrees Celsius (1.08 deg Fahrenheit) over the last 100 years. Further warming will likely cause the disappearance of Arctic summer sea ice, further oxygen depletion and the release of Earth-warming methane trapped in the Arctic seabed. From this it is clear that the oceans are declining rapidly due to three reasons Ã”Ã‡Ã´ global warming, pollution caused by runoff from agriculture fields, and Arcatic sea ice loss. Global warming in the last 17 years is lull. The sea temperature and carbon dioxide present a systematic variation [see figure given below] with the time like Sunspot cycle see my book Ã”Ã‡Â£Climate change: Myths & RealitiesÃ”Ã‡Ã˜ (I-2008 & II-2010). So, warming and cooling of ocean water is a natural phenomenon operating over centuries. When temperature rises carbon dioxide is released in to atmosphere and temperature fall ocean waters absorbs carbon dioxide from the atmosphere. If we look at the data of seasonal variation of sea ice year by year at Arctic [North Pole] and Antarctic [South Pole] the year to year variations of seasonal trends are above the average at Antarctica and below the average at Arctic in the last decade. They fall within the long term standard deviation limit except 2012 Arctic seasonal pattern that falls below standard deviation shade. In statistical terms even up to twice the standard deviation the extremes occur. The main issue that needs more study is the pollution impact on oceans. With the green revolution technology of chemical inputs, runoff from agriculture farms entering oceans and creating dead zones Ã”Ã‡Ã´ zero oxygen Ã”Ã‡Ã´ like thousands of square kilometers in Gulf of Mexico. Also there are several other sources of pollution contaminating ocean waters. 1. "According to the Commonwealth Scientific and Industrial Research Organization, sea levels on average have been 20 centimeters higher than they were in the 1880s. Water levels are rising at 3.2 millimeters per year, which is double the 20th century trend." My response: In the past on several forums I made the following observations but nobody come forward to respond my question: (1) San Francisco Airport is in the Ocean waters. Was there any rise in sea water level at this point? -- so far no change [I visited several times]; (2) In Italy along the coast, traditional and historical wells showed no change in sea level; (3) It is generally argued that the sea level raise submerged the Sundarbans at the mouth of Ganga River in the Bay of Bengal and villages along Bramhaputra River in Bangladesh -- all this is inaccurate statements. Here the silt deposition from these two mighty rivers causing the submergence of Mangroves and hutments; (4) Also, destruction of Coastline for commercial activities and destruction of Mangroves allowed sea water entering into nearby villages and thus people are attributing it to sea level rise; (5) In several parts, sea sand is lifted for other uses and thus causing the sea water entering in to nearby areas; and (6) Boston area was filled [artificially built] and with the storm surges it looks something happened. Also, sea temperatures are higher in some places and some other places they are cool associated with general circulation patterns existing generally in those zones. These infect the sea level temporarily -- natural variations. Unless we analyze region-wise by taking into account on ground variations in the light of general circulation, natural variations & physical impacts, all model estimates are speculative in nature and create sensation that pickup media. 2. "ocean acidification [due to higher CO2 levels] and warming are causing species like jellyfish to overrun other species in the sea and bleaching and decreasing growth of coral reefs"
My response: In the oceans, temperature change and along with carbon dioxide change is a historical fact. They clearly indicate a clear cut cyclic variations -- I put this in my book "Climate Change: Myths & Realities" published in 2008. As this is not new the life in the ocean automatically adopt to these variations. There is a need to look into other man induced pollution factors in to ocean waters angle to understand their impact on coral reefs as well other species in the ocean. Our research, therefore, must direct to understand the cause and effect mechanism. With the preconceived ideas we go nowhere. This is exactly what is happening now. This is bad science -- though many a times such studies are published in reputed journals, as editorial boards work "you scratch my back and I scratch your back". 3. "The physical principles behind climate change are simple, well known since the 1800s, and won't wait for this fake debate to end." My response: This point I did not understand, here climate change means a de facto global warming or all issues pertaining to changes in climate. As per global warming there are no clear cut physical principles. We can see in the literature every other day a new issue comes up. Now, even IPCC also changed and telling urban-heat-island affect also contributing to global warming by about 10% -- initially they did not accounted this --. There are several other issues like natural variation component, solar components, ecological changes components [that influence local and regional climate], physical impacts on ecological sensitive zones like ice, etc. It is not clear on the link between carbon dioxide and temperature. It is a statistical link. It varies with the accumulation of data series period and it does not explain the physical relationship. The main component that at present influencing climate and extremes is the natural variations -- systematic & irregular variations -- and ecological changes such as changes in land use and land cover -- effect local and regional climate and thus change the natural variations to that extent. At Antarctica the sea ice melt in the last six years is above the mean while it is below the mean in Arctic area. Why don't they just show the annual temperature graph? They always thought it most appropriate in the past. Why do they begin this graph in 1850? Anthropogenic Climate Change, according to their report, could not have started before *19* 50 (a hundred years later). So why isn't the chart, and all the ballyhooed temperature increase, started in 1950? If AGW didn't start (couldn't start, actually, as we hadn't yet added the CO2 to the atmosphere), what caused the temperature rise starting in 1890? Whatever that cause is, what made that cause stop and suddenly change to CO2 -caused in 1950? Models present a monotonic increase as the models are built with some preconceived notions -- that means what you are able to think only goes in to the model. Nature in fact acts differently based on several unknown and known factors. So, the real pattern goes on changing with the time. However, this is affected by scientistsÃ”Ã‡Ã– manipulation of data and changes in land use and land cover as weather is highly sensitive to such variations. Also, we are experiencing changes due to man's physical actions and manipulation of terrain. These changes are alarmingly increasing with population growth and changing technologies to meet their lifestyles and needs. In global models such factors taken in to account rarely. Also natural disasters do change the terrain conditions. And above all, the natural variations are not the same over different parts of the globe. Instead of talking on a generalized term "global warming", it is more appropriate to use the term "regional climate changes". This is more useful in regional planning. Global temperature data is manipulated, global carbon dioxide data is manipulated. Meteorological data collection is changing with the time over land and in/on oceans with network and instrumentation changes. Satellite data is highly manipulated!!! In 70s & 80s, before encroachment of global warming in to climate studies, before starting analyzing rainfall data by clubbing the rainfall of different rain gauge stations, we used to homogenize the rain gauge stations in terms of rainfall patterns. This helped to understand the climate of different parts in a region. This helped better interpretation of the results so analyzed in terms of agriculture or water management. It appears this is lacking in IPCC studies and counter positive and negative trends giving false notions or predictions. Other important issue is, IPCC talks of probability. Probabilities relevance with data but not number of people accepted it. This is bad science. In science the phrase 70% probable or 90% probable had definite meanings. They imply controlled trials, they imply numerical quantitative information objectively assessed. If you ask the IPCC they will tell you that when they use the term 95% probable it is based on the expert opinion of a group of people gathered around a table. It is completely wrong to use probability terminology to describe what is albeit an expert opinion. The global yearly temperature pattern presents a 60 year cycle -- sine curve with 30 years above the average and 30 years below the average -- varying between -0.3 to +0.3 degrees Celsius superposed on a linear fit Ã”Ã‡Ã´ according to this by 2100 the rise is around one degree Celsius Ã”Ã‡Ã´ see figure given below. However, year to year variations, known as irregular variations are common. Anybody can try this. Nothing is secret here. Look at WMO (1966) Manual "Climate Change". You can take the published temperature data. The linear part consists of several components that are influencing globally. Here you get good probability unlike IPCCs probability based on number of persons agreed. We must not forget the fact that when we talk of precipitation, we must first demarcate homogeneous zones in region based on individual rain gauge stations data. In a homogeneous zone the rainfall presents similar patterns. If we mix non-homogeneous zones and take the average, the average patterns do not reflect the realistic pattern and mislead the interpretation and the consequent impacts. Take for example: Durban in South Africa, Mahalapye in Botswana & Catuane in Mozambique -- all the three present W followed by M pattern of 66, 60 & 54 year cycles. When we add these three get meaningless result for agriculture purposes. I did homogenization studies for few countries including Brazil. This is a very interesting discussion. Both Dr. Ramesam and Dr. Jeevananda Reddy are qualified people. But on a topic like this even we can hold views... may be a layman's science. One observation I made when I was flying from Calcutta to Andamans in August, max rainfall period, is for over 700 KM the sea was red like river water. Obviously the silt brought in both by the Ganges and Brahmaputra. I felt then that one day (may be in a couple of centuries) the entire eastern coast of INDIA may change. So I agree with Dr J.Reddy that it is siltation, and not rising sea levels that sunderbans are experiencing. Regarding the coral reefs. I worked in Salaya Vadinar area. Daily I used to walk 6 Km up and down the sea to survey for a pipie. I used to see a variety of corals , and fish and octopus etc. I saw coral Rocks of over 1 meter Dia. There was a cement factory at Salaya which used to burn off tons and tons of the coral reef. (it is stopped now).The cutting of the mangrove for fire wood was responsible for the disappearence of corals. Here too Dr. J. REDDY is correct. As you know, this is too hot a topic to touch without being an expert in the field. Out of respect for you, because of you specifically asking me, I venture to say something here purely based on the limited knowledge I have acquired during my own field studies in allied areas. But unfortunately many people who make the loudest noise are the people who had hardly worked in the field. Most of them express their "feeling" as if it is a scientific fact. Knowing the conditions of the raw data, the way it is collected, the high variability in the actual measured values in the field, the technical capabilities of the staff that collect the raw base data, the competence of the "Academics" who handle and process the data sitting in their air-conditioned rooms or 5-star hotels and the way they go about attracting research funding; and the uncertainties in the mathematical models, the poor knowledge on the physics of the global systems of climate; and the enormity in the magnitudes of scales of energies involved in the planetary level natural processes and what a puny human being can/cannot do; and keeping in mind many such issues, I am inclined to side with Dr. Jeevanandareddy's opinion. These are purely my personal views (rather hunches) based on my personal acquaintance of the different people and practices prevalent in India and I may not have time to enter into intricate debate on the various points made by me. I do not know who is this Jeevanandareddy or his experience and would be happy if you can let me know. Appeal: There is a need to look in to climate change issues in Indian perspective rather than blindly following IPCC model based hypothetical studies with low scientific integrity, which have their vested interests. If we go on concentrating our research on IPCC type research in our Indian institutes we achieve nothing except waste of public money. Let me give an example on this, which in fact communicated to you, Madame, the El Nino related rainfall and impact on crop production published in a Telugu daily as supllied by one of the ICAR groups. it is true that this year has seen many extreme weather events; the best we can do is to adapt to all kinds of weather changes, and look into other causes that amplify the magnitudes of such disasters instead of blaming it all on climate change. better city and town planning and stringent policies, rules and laws are required. climate change sceptics may oppose the climate change view but it is not right on the part of an esteemed publication like DTE to endorse IPCC, they have been proven wrong in the past and cannot be given the benefit of doubt. what it should be doing is push for better adaptation measures and things that will improve the situation. How far can we capitalize? How far can we capitalize? How soon? and How well? Does the policy makers see it as an asset or a liability? In the editorial, Climate Science in Real World, I was struck by the sentence "This means becoming obsessive with water management". How true this is. I intend to quote this line in my future presentations, and mention its source. In sum another brilliant and thought provoking editorial from Ms. Sunita Narain. A very well articulated editorial indeed. I totally agree with you on this. Climate change is here. It's impacts are experienced from the most poor community to even rich. Hurricane sandy, uttarakhand floods and now Andhra cyclone, all signify the same. But what needs to be noted here is the level of preparedness and the adaptive capacities of these regions is what defines the vulnerability. Hence there needs to be integration, co-ordination and investments to combat the impacts of cc in a planned way. One size fits all cannot be an approach here. Solutions need to be customised and tailor made to suit the regions/locations. Courtesy The Hindu News Paper: The project site harboured wetland and was a natural breeding ground for several species of birds. The area was also home to 308 tribal people who played a major role in agro-biodiversity conservation. As much as 67.7 hectares of the 135.4 hectares identified was under paddy cultivation, with the rest under cash crops. Get well soon Sunitaji. Wish you a very very happy Dipawali. It appears climate scientists need more robust support for statistical analysis. Long, long ago while studying 'Time Series Analysis'. I remember to have read that for trend analysis 3 year average, based at middle year are taken. If that practice were folloewed for temperature data, discrepancy due to El Nino' would have smoothed out. The discipline Mathematical Statistics & Probability has made tremendous advances which should be used for future predictions.